We received the following a message a few weeks ago - hopefully this nice Carolina couple hasn't had any more scratches before we got a chance to post this story. Oh, and please submit your boat names below! My wife and I bought a 2010 SeaRay 240 SunDancer and are struggling to come up with a name for her. 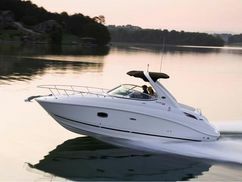 I was and still am a golfaholic, but I have always liked being out on a boat. We live in Charleston SC and this is the 1st time I have been on a boat that wasn't on a lake. I have been a big Hootie and the Blowfish fan, so much we named our Dog "Hootie". We used to live up in Asheville NC before we move to Charleston so we are still trying to get used to the low country. 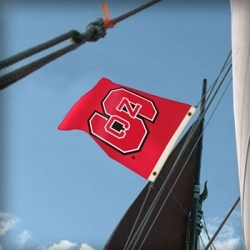 I went to NC STATE and I am a big supporter of their athletic program. We have looked at tons o boat names to try and come up with ideas but have not made any progress on our maiden voyage we actually had trouble docking and got our first "scratch" which cost us $600 to get fixed so we need to find a name soon before we REALLY have problems. You don't want the obvious? Blowfish? Driver 8! Goodbye Girl! Blowfish is a good one.Tucker's Town! Almost Home!